76. Some have imagined that both grace and sin - that is, the spirit of truth and the spirit of error - are hidden at the same time in the intellect* of the baptized. As a result, they say, one of these two spirits urges the intellect to good, the other to evil. But from Holy Scripture and through the intellect's own insight I have come to understand things differently. Before holy baptism, grace encourages the soul towards good from the outside, while Satan lurks in its depths, trying to block all the intellect's ways of approach to the divine. But from the moment that we are reborn through baptism, the demon is outside, grace is within. Thus, whereas before baptism error ruled the soul, after baptism truth rules it. Nevertheless, even after baptism Satan still acts on the soul, often, indeed, to a greater degree than before. This is not because he is present in the soul together with grace; on the contrary, it is because he uses the body's humors to befog the intellect with the delight of mindless pleasures. God allows him to do this, so that a man, after passing through a trial of storm and fire, may come in the end to the full enjoyment of divine blessings. For it is written: 'We went through fire and water, and Thou hast brought us out into a place where the soul is refreshed' (Ps. 66.12. LXX). 77. As we have said, from the instant we are baptized, grace is hidden in the depths of the intellect, concealing its presence even from the perception of the intellect itself. When someone begins, however, to love God with full resolve, then in a mysterious way, by means of intellectual perception, grace communicates something of its riches to his soul. Then, if he really wants to hold fast to this discovery, he joyfully starts longing to be rid of all his temporal goods, so as to acquire the field in which he has found the hidden treasure of life (cf. Matt. 13:44). This is because, when someone rids himself of all worldly riches, he discovers the place where the grace of God is hidden. For as the soul advances, divine grace more and more reveals itself to the intellect. During this process, however, the Lord allows the soul to be pestered increasingly by demons. This is to teach it to discriminate correctly between good and evil, and to make it more humble through the deep shame it feels during its purification because of the way in which it is defiled by demonic thoughts. 78. We share in the image of God by virtue of the intellectual activity of our soul; for the body is, as it were, the soul's dwelling-place. Now as a result of Adam's fall, not only were the lineaments of the form imprinted on the soul befouled, but our body also became subject to corruption. It was because of this that the holy Logos of God took flesh and, being God, He bestowed on us through His own baptism the water of salvation, so that we might be reborn. We are reborn through water by the action of the holy and life-creating Spirit, so that if we commit ourselves totally to God, we are immediately purified in soul and body by the Holy Spirit who now dwells in us and drives out sin. Since the form imprinted on the soul is single and simple, it is not possible, as some have thought, for two contrary powers to be present in the soul simultaneously. For when through holy baptism divine grace in its infinite love permeates the lineaments of God's image - thereby renewing in the soul the capacity for attaining the divine likeness - what place is there for the devil? For light has nothing in common with darkness (cf. 2 Cor. 6:14). We who are pursuing the spiritual way believe that the protean serpent is expelled from the shrine of the intellect through the waters of baptism; but we must not be surprised if after baptism we still have wicked as well as good thoughts. For although baptism removes from us the stain resulting from sin, it does not thereby heal the duality of our will immediately, neither does it prevent the demons from attacking us or speaking deceitful words to us. In this way we are led to take up the weapons of righteousness, and to preserve through the power of God what we could not keep safe through the efforts of our soul alone. 79. Satan is expelled from the soul by holy baptism, but is permitted to act upon it through the body for the reasons already mentioned. The grace of God, on the other hand, dwells in the very depths of the soul - that is to say, in the intellect. For it is written: 'All the glory of the king's daughter is within' (Ps. 45:13. LXX), and it is not perceptible to the demons. Thus, when we fervently remember God, we feel divine longing well up within us from the depths of our heart. The evil spirits invade and lurk in the bodily senses, acting through the compliancy of the flesh upon those still immature in soul. According to the Apostle, our intellect always delights in the laws of the Spirit (cf. Rom. 7:22), while the organs of the flesh allow themselves to be seduced by enticing pleasures. Furthermore, in those who are advancing in spiritual knowledge, grace brings an ineffable joy to their body through the perceptive faculty of the intellect. But the demons capture the soul by violence through the bodily senses, especially when they find us faint-hearted in pursuing the spiritual path. They are, indeed, murderers provoking the soul to what it does not want. 80. There are some who allege that the power of grace and the power of sin are present simultaneously in the hearts of the faithful; and to support this they quote the Evangelist who says: 'And the light shines in the darkness; and the darkness did not grasp it' (John 1:5). In this way they try to justify their view that the divine radiance is in no way defiled by its contact with the devil, no matter how close the divine light in the soul may be to the demonic darkness. But the very words of the Gospel, show that they have departed from the true meaning of Holy Scripture. When John the Theologian wrote in this way, he meant that the Logos of God chose to manifest the true light to creation through His own flesh, with great compassion kindling the light of His holy knowledge within us. But the mentality of this world did not grasp the will of God, that is, it did not understand it, since 'the will of the flesh is hostile to God' (Rom. 8:7). Indeed, shortly afterwards the Evangelist goes on to say: 'He was the true light, who illumines every man that comes into the world' - meaning by this that He guides every man and gives him life - and: 'He was in the world, and the world was made by Him, and the world did not know Him. He came to His own, and His own did not receive Him. But to those who received Him He gave power to become the sons of God, even to those who believe in His name' (John 1:9-12). Paul, too, interprets the words 'did not grasp it' when he says, 'Not as though I had already grasped it or were already perfect, but I press on in the hope of grasping it; for it was to this end that I have been grasped by Jesus Christ' (Phil. 3:12). Thus the Evangelist does not say it is Satan who has failed to grasp the true light. Satan was a stranger to it from the beginning, since it does not shine in him. Rather, the Evangelist is censuring men who hear of the powers and wonders of the Son of God, and yet in the darkness of their hearts refuse to draw near to the light of spiritual knowledge. 81. Spiritual knowledge teaches us that there are two kinds of evil spirits: some are more subtle, others more material in nature. The more subtle demons attack the soul, while the others hold the flesh captive through their lascivious enticements. Thus there is a complete contrast between the demons that attack the soul and those that attack the body, even though they have the same propensity to inflict harm on mankind. When grace does not dwell in a man, they lurk like serpents in the depths of the heart, never allowing the soul to aspire towards God. But when grace is hidden in the intellect, they then move like dark clouds through the different parts of the heart, taking the form of sinful passions or of all kinds of day-dreams, thus distracting the intellect from the remembrance of God and cutting it off from grace. When the passions of our soul, especially presumption, the mother of all evils, are inflamed by the demons that attack the soul, then it is by thinking on the dissolution of our body that we grow ashamed of our gross love of praise. We should also think about death when the demons that attack the body try to make our hearts seethe with shameful desires, for only the thought of death can nullify all the various influences of the evil spirits by bringing us back to the remembrance of God. If, however, the demons that attack the soul induce in us by this thought an excessive depreciation of human nature on the grounds that, being mortal, it is valueless - and this is what they like to do when we torment them with the thought of death - we should recall the honor and glory of the heavenly kingdom, though without losing sight of the bitter and dreadful aspects of judgment. In this way we both relieve our despondency and restrain the frivolity of our hearts. 82. In the Gospels the Lord teaches us that when Satan returns and finds his home swept and empty - finds, that is to say, the heart barren - he then musters seven other spirits and enters it and lurks there, making its last state worse than its first (cf. Matt. 12:44-45). From this we must understand that so long as the Holy Spirit is in us, Satan cannot enter the depths of the soul and remain there. Paul too clearly conveys this same spiritual understanding. 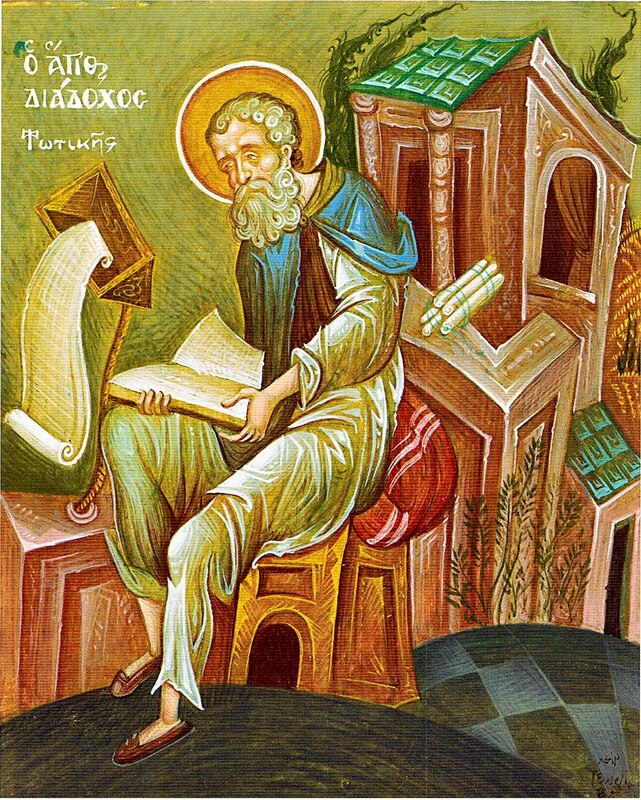 When he looks at the matter from the viewpoint of those still engaged in the ascetic struggle, he says: 'For with the inward man I delight in the law of God; but I see another law in my members, warring against the law of my intellect, and bringing me into captivity to the law of sin which is in my members' (Rom. 7; 22—23). But when he looks at it from the viewpoint of those who have attained perfection, he says: 'There is therefore now no condemnation of those who are in Christ Jesus, who do not walk according to the flesh but according to the Spirit. For the law of the Spirit of life in Christ Jesus has freed me from the law of sin and death' (Rom. 8:1-2). Again, so as to teach us once more that it is through the body that Satan attacks the soul which participates in the Holy Spirit, he says: 'Stand, therefore, having girded your loins with truth, and having on the breastplate of righteousness, and having shod your feet with the gospel of peace; above all, taking the shield of faith with which you will be able quench all the fiery arrows of the evil one. And take the helmet of salvation and the sword of the Spirit, which is the word of God' (Eph. 6:14-17). Captivity is one thing, battle is another. Captivity signifies a violent abduction, while battle indicates a contest between equally matched adversaries. For precisely this reason the Apostle says that the devil attacks with fiery arrows those who carry Christ in their souls. For someone who is not at close grips with his enemy uses arrows against him, attacking him from a distance. In the same way, when, because of the presence of grace, Satan can lurk no longer in the intellect of those pursuing a spiritual way, he lurks in the body and exploits its humors, so that through its proclivities he may seduce the soul. We should therefore weaken the body to some extent, so that the intellect does not slide down the smooth path of sensual pleasure because of the body's humors. We should believe the Apostle when he says that the intellect of those pursuing the spiritual way is energized by divine light, and therefore obeys and rejoices in the law of God (cf. Rom. 7:22). But the flesh, because of its proclivities, readily admits evil spirits, and so is sometimes enticed into serving their wickedness. Thus it is clear that the intellect cannot be the common dwelling-place of both God and the devil. How can St Paul say that 'with my intellect I serve the law of God, but with the flesh the law of sin' (Rom. 7:25), unless the intellect is completely free to engage in battle with the demons, gladly submitting itself to grace, whereas the body is attracted by the smell of mindless pleasures? He can only say this because the wicked spirits of deception are free to lurk in the bodies of those pursuing a spiritual way; 'for I know that in me - that is, in my flesh - there dwells nothing good' (Rom. 7:18), says the Apostle, referring to those who are resisting and struggling against sin. Here he is not merely expressing a personal opinion. The demons attack the intellect, but they do so by trying through lascivious temptations to entice the flesh down the slope of sensual pleasure. It is for a good purpose that the demons are allowed to dwell within the body even of those who are struggling vigorously against sin; for in this way man's freewill is constantly put to the test. If a man, while still alive, can undergo death through his labors, then in his entirety he becomes the dwelling-place of the Holy Spirit; for such a man, before he has died, has already risen from the dead, as was the case with the blessed Apostle Paul and all those who have struggled and are struggling to the utmost against sin. 83. It is true that the heart produces good and bad thoughts from itself (cf. Luke 6:45). But it does this not because it is the heart's nature to produce evil ideas, but because as a result of the primal deception the remembrance of evil has become as it were a habit. It conceives most of its evil thoughts, however, as a result of the attacks of the demons. But we feel that all these evil thoughts arise from the heart, and for this reason some people have inferred that sin dwells in the intellect along with grace. That is why, in their view, the Lord said: 'But those things which proceed out of the mouth come forth from the heart; and they defile the man. For out of the heart proceed evil thoughts, adulteries', and so on (Matt. 15:18-19). They do not realize, however, that the intellect, being highly responsive, makes its own the thoughts suggested to it by the demons through the activity of the flesh; and, in a way we do not understand, the proclivity of the body accentuates this weakness of the soul because of the union between the two. The flesh delights endlessly in being flattered by deception, and it is because of this that the thoughts sown by the demons in the soul appear to come from the heart; and we do indeed make them our own when we consent to indulge in them. This was what the Lord was censuring in the text quoted above, as the words themselves make evident. Is it not clear that whoever indulges in the thoughts suggested to him by Satan's cunning and engraves them in his heart, produces them thereafter as the result of his own mental activity? 84. The Lord says in the Gospel that a strong man cannot be expelled from a house unless someone stronger than himself disarms him, binds him and casts him out (cf. Matt.12:29). How, then, can such an intruder, cast out in this shameful way, return and dwell together with the true master who now lives freely in his own house? A king, after defeating a rebel who has tried to usurp his throne, does not dream of allowing him to share his palace. Rather, he slays him immediately, or binds him and hands him over to his soldiers for prolonged torture and a miserable death. 85. The reason why we have both good and wicked thoughts together is not, as some suppose, because the Holy Spirit and the devil dwell together in our intellect, but because we have not yet consciously experienced the goodness of the Lord. As I have said before, grace at first conceals its presence in those who have been baptized, waiting to see which way the soul inclines; but when the whole man has turned towards the Lord, it then reveals to the heart its presence there with a feeling which words cannot express, once again waiting to see which way the soul inclines. At the same time, however, it allows the arrows of the devil, to wound the soul at the most inward point of its sensitivity, so as to make the soul search out God with warmer resolve and more humble disposition. If, then, a man begins to make progress in keeping the commandments and calls ceaselessly upon the Lord Jesus, the fire of God's grace spreads even to the heart's more outward organs of perception, consciously burning up the tares in the field of the soul. As a result, the demonic attacks cannot now penetrate to the depths of the soul, but can prick only that part of it which is subject to passion. When the ascetic has finally acquired all the virtues - and in particular the total shedding of possessions - then grace illumines his whole being with a deeper awareness; warming him with great love of God. From now on the arrows of the fiery demon are extinguished before they reach the body; for the breath of the Holy Spirit, arousing in the heart the winds of peace, extinguishes them while they are still in mid-air. Nevertheless, at times God allows the demons to attack even one who has reached this measure of perfection, and leaves his intellect without light, so that his free will shall not be completely constrained by the bonds of grace. The purpose of this is not only to lead us to overcome sin through ascetic effort but also to help us advance still further in spiritual experience. For what is considered perfection in a pupil is far from perfect when compared with the richness of God, who instructs us in a love which would still seek to surpass itself, even if we were able to climb to the top of Jacob's ladder by our own efforts. From "On Spiritual Knowledge and Discrimination: One Hundred Texts", The Philokalia, vol. 1. * Here "intellect" is used as a translation for the word nous, which is the highest faculty in man, that dwells in the depth of the soul or heart, through which - provided it is purified - he knows God or the inner essences or principles of created things by means of direct apprehension or spiritual perception. The understanding of divine truths by the nous is through experience, and it should be distinguished from dianoia or deductive reasoning.